If you’ve ever planned an event, you’ve learned early on (and perhaps the hard way!) that it’s never a “one-and-done” process. No matter the size, there are a lot of moving parts and considerations to take into account. Sometimes you need a helping hand. Recently, we looked at a few simple apps that can be immensely helpful in the planning, execution and follow-up stages of your event. Technology changes fast. There have been some great updates and new offerings for planning tools; here you’ll find an up-to-date list. Pro Party Planner is the top party planning app on iTunes – and it’s obvious why. It allows you to import guest lists, delegate tasks, set reminders or sync across multiple users and Facetime them from within the app. You can even create seating charts and plan the room set-up with the augmented reality feature to help you visualize how everything will look without physically rearranging the furniture. A useful timeline shows you what needs to get done in real time. 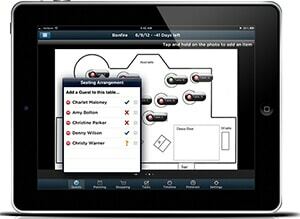 Planning Pod comes with more than 26 timesaving tools that help streamline the event planning process. Spreadsheet organization, room layouts, guest lists, itineraries, budgets and collaboration capabilities take the guesswork out of your daily tasks. Because maintaining the energy within your meeting is crucial, icebreakers can be a fantastic way to begin – and can help set a positive tone for the rest of the day. Consider Heads Up, a technological upgrade of charades created by Ellen DeGeneres. Attendees place a smartphone or tablet on their foreheads and their partner has to guess the word displayed on the screen as the timer ticks. The app also records a video of the person trying to guess the clue – another fun app feature! This web-based platform is your “during-event” monitor. Using unique, event-related hashtags on Twitter can be a powerful tool to help spread awareness for your event and can encourage a trending topic. Mention is useful for tracking the use of any keyword or URL on Twitter and the wider web. With this tool, you’ll be able to easily jump in and answer any questions guests may have or simply track where and when your event is being talked about online – and illuminate what is resonating with attendees and what isn’t. While these apps and tools are fantastic for supporting your planning needs, don’t forget to tap the expertise of your venue staff. If you have any questions or need support in planning your next event at Monona Terrace, contact Laura MacIsaac, CMP, at 608.261.4016.